Perma Moly is a multi-purpose, water resistant, anti-wear grease made from solvent refined, severely hydrofinished 100% paraffin base stocks with a high viscosity index. Made with a bentone base, Perma Moly performs exceptionally well in industrial bearings and machinery operating under heavy loads and in high temperatures. Blended into Perma Moly is an inorganic thickener, allowing the grease to lubricate bearings effectively in temperatures up to 500°F to 600°F. Using synthesized moly, Perma Moly quickly plates to metal surfaces, creating a fine but durable lubricant film that lasts longer than conventional greases. 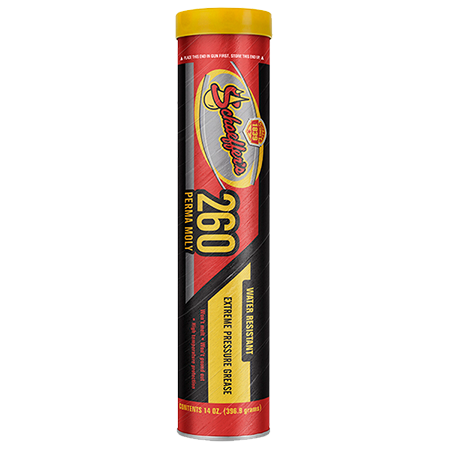 During periods of excessive pressure, increased heat and high shock loads, this versatile grease remains with bearings and resists breaking down. This extra layer of protection allows Perma Moly to reduce wear and contact area temperature, which leads to increased equipment life, less downtime and extended lubrication cycles. Perma Moly Grease NLGI #2 has a high base oil viscosity (ISO 460) for extra protection on tough, heavy loaded, low-to-moderate speed applications.